We will install Linux Unified Key Setup (LUKS) software and create an encrypted LUKS volume. It is strongly advised to read cryptsetup FAQ first: http://gitlab.com/cryptsetup/cryptsetup/wikis/FrequentlyAskedQuestions. # fdisk -l | grep -i "/dev/sd"
We will be setting up a LUKS volume on a 1GB partition /dev/sdb2. This will overwrite data on /dev/sdb2 irrevocably. [UPDATE]: release 1.6.0 of cryptsetup changed the defaults to an AES cipher in XTS mode. It is advised against using the previous default cipher aes-cbc-essiv because of its known issues and practical attacks against them. Next thing on a list: add a backup key and backup the LUKS header. This entry was posted in Linux, Security and tagged cryptsetup, Debian, LPIC-3, LUKS. Bookmark the permalink. If you notice any errors, please contact us. You’re right, thanks. However, it works both ways. The cryptsetup FAQ mentions a very simple procedure to use an existing dm-crypt-volume to wipe all free space accessible on the underlying block device with random data by acting as a simple pseudorandom number generator. It is also claimed to protect against disclosure of usage patterns. 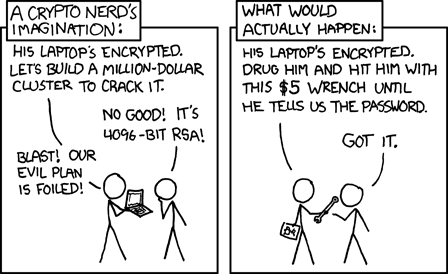 That is because encrypted data is practically indistinguishable from random.